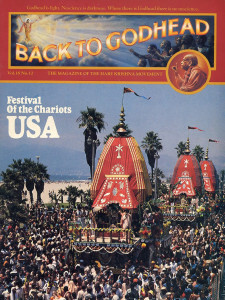 Regular readers of BACK TO GODHEAD will notice the new format for “The Vedic Observer.” These articles and pithy illustrations offer Krsna conscious commentary on the issues of the day. Already this has become one of our most popular features, proving the relevance of the Krsna conscious viewpoint. If you’re a person who follows world events with an analytical eye, don’t dismiss “The Vedic Observer” simply because it gives the spiritual or absolute viewpoint. Even if you regard yourself as a secular, objective judge of world events, you have to formulate some point of view—democratic, Marxist, humanistic, or whatever. The viewpoints in “The Vedic Observer” are based on a profound, ancient science of God consciousness, and they deserve at least as much careful attention as the various viewpoints of our ordinary commentators and political analysts with their varied slants on the news. Yes, Krsna conscious reporting is also from a particular viewpoint—the viewpoint of the Absolute Truth. The obvious difficulty here is whether the average American is qualified to sift and sort and check and countercheck and arrive at anything more than confusion. Or he may conclude that since everyone else’s views are petty and self-interested, he might as well do the same and not even try for a higher standard of justice or objectivity. “The Vedic Observer,” however, allows the reader to see his world through the eyes of transcendental knowledge. Most people keep up with world events through newspapers, news magazines, radio, and television, but such mundane coverage is presented through the mind and eyes of conditioned souls. According to Vedic knowledge, all conditioned souls have four defects: they make mistakes, they become illusioned, they sometimes cheat, and their senses are imperfect. “The Vedic Observer,” however, is above these defects, because it is fully grounded in transcendental knowledge. If—without knowledge of the Supreme, the eternal self, and the ultimate goal of life—we analyze current events, we may increase our stock of facts, but not our depth of understanding these facts. “The Vedic Observer” bares problems to their very root and provides solutions—something no ordinary news editorial can do. Consider the vitriolic column by George Will in Newsweek on the Korean Air Lines tragedy. Mr. Will angrily criticized what he considered an inadequate response from President Reagan to the Soviets, and he suggested more radical measures—a break in diplomatic relations with the Soviet Union, a grain embargo, and so on. But he couldn’t offer any explanation as to why enmity between nations exists. From the Krsna conscious viewpoint, however, we can see that nationalism is the culprit, because the people of a nation so strongly identify with their land, without any reference to the supreme proprietor. God. Only the Krsna conscious viewpoint can show how to alleviate international enmity, because only by Krsna consciousness can people transcend their superficial differences and come to the spiritual platform, the only platform of unity. For a commentator like Mr. Will, nationalism is an axiomatic truth, yet such a “truth” is the very cause extensions between one nation and another. All lands belong to God, and until we can realize this and act accordingly, we cannot have united nations or world peace. “The Vedic Observer,” unlike most editorial pages, has no political ax to grind. The Korean Air Lines tragedy, for example, was reported in the Soviet Union only sketchily, and in such a way as to serve the propaganda interests of the ruling elite. Americans pity the misinformed Russian people and are outraged at the Soviet government. And yet Americans are also receiving news with a certain slant. But “The Vedic Observer,” being transcendental, is automatically free from political, racial, or religious bias. “The Vedic Observer” is also practical because it gives the reader advice in dealing with today’s problems. One of last month’s editorials dealt with the Korean Air Lines incident in terms of how the members of one family began to change their lives for the cause of world peace and saw how the lives of millions of others could be changed by Krsna consciousness. Another editorial aimed directly at the futility of gambling. Such essays prod the reader to do something, to change his life by taking up God consciousness. A Krsna conscious writer follows the news just like anyone else, but because of his transcendental insights, he’s able to provide solutions. Certainly everyone knows already the Soviets and the Americans have enough weapons to destroy each other and the whole world, so what is more important—knowing this or knowing how to stop it? World problems need realistic solutions, not simply detailed reporting, and this is the unique and valuable contribution of the Krsna conscious writer. “The Vedic Observer” is the most relevant commentary, because it draws on the most authoritative information, the directions given by the Supreme Personality of Godhead, Lord Krsna. As IBM has computer handbooks and as General Motors has auto handbooks, so God provides a handbook, the Vedic literature, as an operator’s manual to guide us in utilizing the material energy wisely and profitably. Devotee-writers see behind the complex picture of world events the illusory material energy, the innumerable spiritual souls, the laws of karma, and ultimately the supreme controller, Krsna. If a news commentator is ignorant of these, then everything he says will be incorrect. As Krsna says in the Bhagavad-gita, “While speaking learned words, you are talking like a fool.” The devotee-writer does not make this mistake. He does not speak without reference to God’s handbook, and therefore, he does not mislead others.